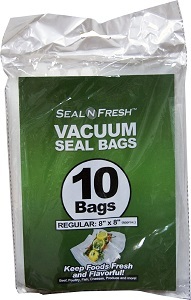 Keep your food at its best with this set of 10 Regular (8" x 8") Seal 'N Fresh Vacuum Seal Bags. They help lock in food's natural flavors, nutrients, and moisture. Season your favorite meats or fish before vacuum sealing the bag for more intense flavors and enhanced textures. Eliminates Wasted Food - Fast & Easy to Use - Seals In Seconds!